Marking more than 20 years of exhibition, LJA subsidiary WAI Continuum is returning to the annual Leading Age Minnesota convention at Saint Paul's RiverCentre. A design specialist serving the senior housing and healthcare industry, WAI has appeared numerous times as a conference speaker at this event serving care providers throughout the state. This year, WAI returns as an exhibitor. We invite you to stop by booth #326 and say hello to WAI Vice President Scott Koester as he connects with clients old and new and answers questions about how care providers can reposition aging facilities to maximize marketability, profitability and resident quality of life. The office was tense this morning as the 2018 LJA Chili COOK-OFF was once again upon us. This event, which usually kicks off Super Bowl Week, was all about bragging rights until this year. A gift card, one that could bring the winner to a variety of dining establishments, was at stake if you could claim the best Chili at LJA. As the clock struck noon employees rushed down to the Team Building Room to sample the 4 concoctions. One by one the votes came in as many looked on in wonder who would claim the crown. You could say some of the contestants looked overconfident while others seemed worried as the crock pots were emptied. So who won the Quest to Be the Best you might ask? Well, that title goes to Nate Anderson who is a Professional Land Surveyor but also a Professional Chili Maker as he reclaimed his title. Congratulations Nate and enjoy that gift card! LJA and Hannaher's Workplace Interiors teamed up this past Fall to "Solve the Mystery of Hunger" at the 2017 CANstruction event held at West Acres Mall in Fargo. It was a great opportunity to combine the competitive spirit of a design/build competition with a unique way to help feed hungry people in the community. We are excited to announce that through our efforts, we are able to present the Great Plains Food Bank with an additional check for $719.40! We believe that investing in our communities benefits us all. We could not accomplish our goal without the support of our generous donors and our dedicated teammates. Interested in knowing how it all came together? Check out the stats below! Santa Claus made his annual visit to the LJA office last week, handing out gifts to an excited crowd that were eagerly awaiting his appearance. We made sure to provide the treats which included hot cocoa, candy canes, and a variety of cookies. The atmosphere was full of cheer as the presents were slowly unwrapped and the treats were quickly devoured. As Santa left he wished everyone a Merry Christmas and promised to return again leaving memories behind that will last a lifetime. LJA & Hannaher's award winning team! 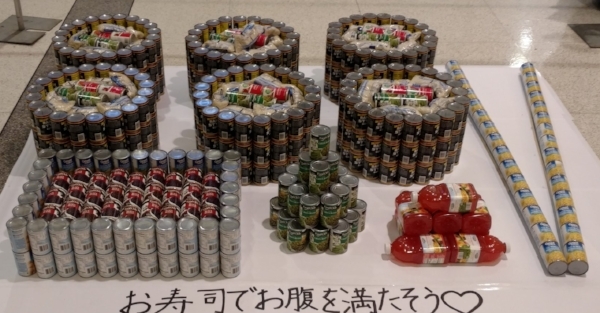 Last month LJA and Hannaher's Workplace Interiors in Fargo teamed up to "Solve the Mystery of Hunger" at the 2017 CANstruction Competition. 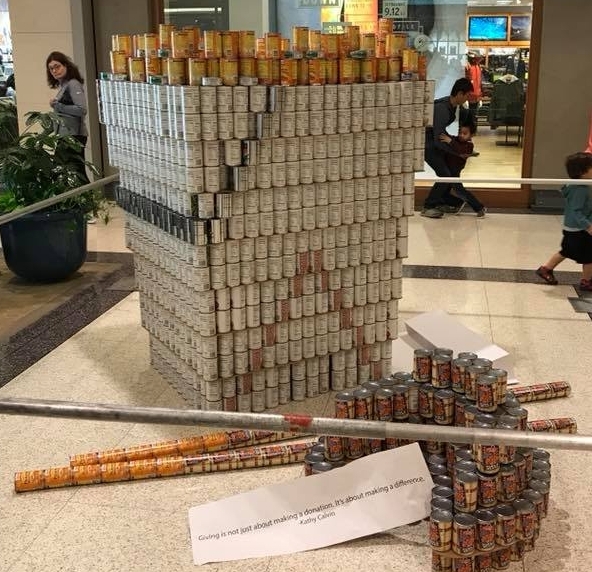 The event consisted of competing teams, led by interior designers and architects, showcasing their talents by designing giant sculptures made entirely out of canned goods which are donated to the Great Plains Food Bank. This year the team took on the challenge to build the The Mystery Machine from Scooby Doo. 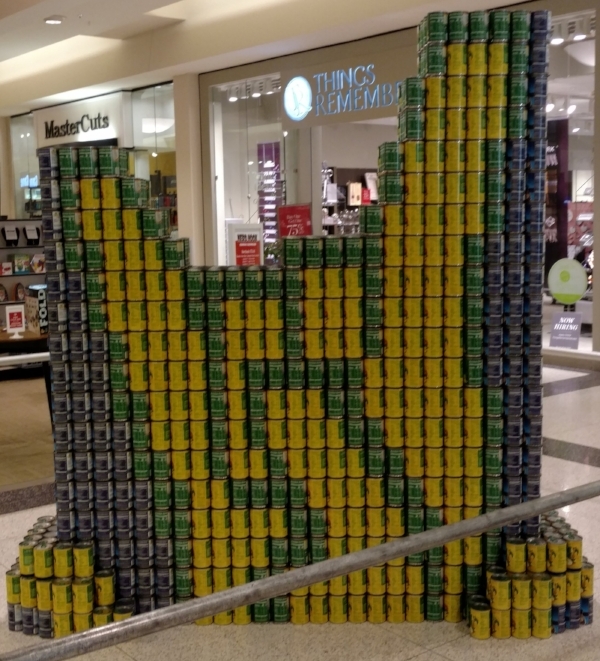 After many meetings and late nights the 2,000 can structure was finally on display at West Acres Mall for everyone to see. After the official judging took place, the gang took home two awards (BEST USE OF LABELS & BEST MEAL). 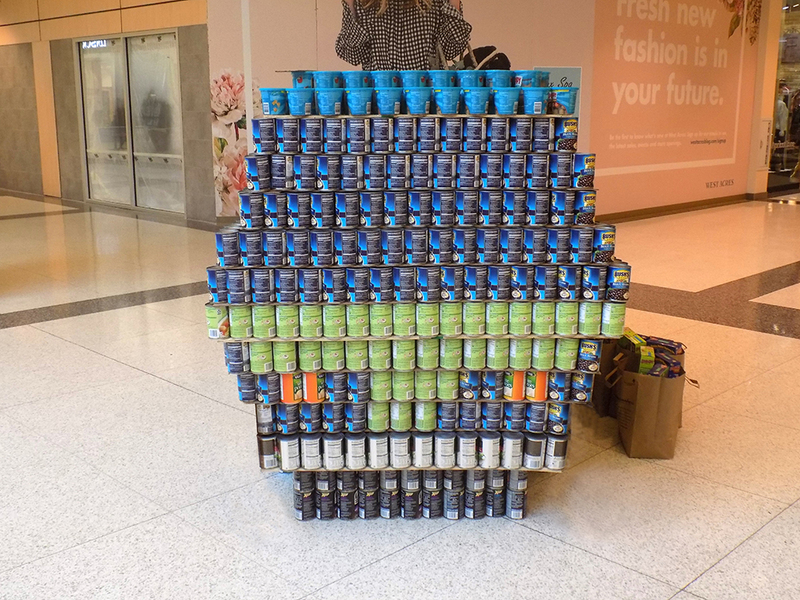 The next week The Mystery Machine took home THE PEOPLE'S CHOICE AWARD making this CANstruction competition one to remember! LJA along with Hannaher's would like to thank all of our sponsors that made this happen, your donation will directly impact thousands of families right here in our community! They are ready to solve "The Mystery of Hunger!" 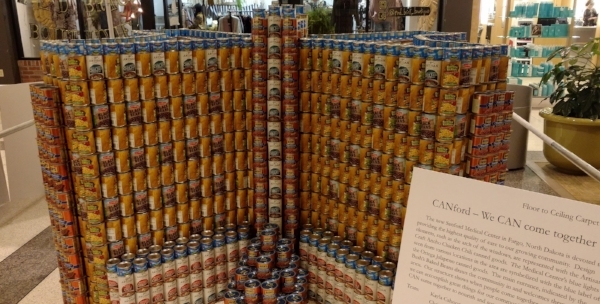 Check out some of the other amazing CANstruction entries! Who's hungry for some sushi? Hey look! It's the new CANford Hospital! Stomping out hunger! Hey check out those shoe laces!!! Not into sushi? Order some Chinese food to go! Earlier this month we attended the Minnesota Hospitality Conference & Expo where we had a successful day connecting and learning from so many people in the hospitality community. With over 150 vendors in attendance at the St. Paul RiverCentre this was a tremendous day to reach new markets, see old faces and build relationships in this exciting industry. This was our first time at the expo but it won’t be our last as we look forward to this vibrant event again in 2018. Grilling season ends at LJA with the 3rd Annual Slider Competition! For the third consecutive year LJA ended the grilling season with a competition like no other: The Slider Competition. Four teams, four different sliders but only ONE WINNER! With only ninety minutes to prepare the nerves were tested as the grills were fired up and the judges waited. Team Brady, Broadway Joe's, 3 Sliders & A Bun and Arch Angels exhausted all resources to win the honor of saying they had THE ULTIMATE SLIDER. With taste, presentation and creativity all being deciding factors Broadway Joe's NORTH SHORE SLIDER easily took the crown and claimed bragging rights. Congratulations to everyone that made this event a success, see you next year! LJA and Rebound Hospitality are excited to announce the completion of the Fairfield Inn & Suites in Decorah, Iowa. This 4 story hotel is the latest project that LJA has completed with Rebound who will both own and operate the hotel. The 84 unit hotel features an enlarged pool and fitness room, outdoor patio off the breakfast room and includes an electric vehicle charging station. Joe Lorsung, Project Architect, who grew up in nearby Charles City, is thrilled to see the work and collaboration of many organizations and people coming together to make the project a reality. A ribbon cutting was held earlier in the month to celebrate the grand opening. Leave to baseball to give the staff at LJA and its subsidiary WAI office a reason to meet! P.S. Shout out to the Fargo/Moorhead Redhawks, who won 6-2! LJA Architecture Deptartment Head Todd Jelinski and WAI Project Manager Greg Kinney. LJA Structural Drafter Jess Jacobsen, LJA Architectural Drafter Peggy Hall with WAI Project Architect Jude Hallamek. Despite the ominous looking sky, by this time the rain stopped and it became much more enjoyable! LJA Structural Engineer Deb Palmer, LJA Architect Holli Hasbargen, LJA President Troy Tooz, WAI Founder Dave Wolterstorff, LJA Mechanical Engineer Brander Halver. WAI Construction Supervisor Jake Jacobsen and WAI Architectural Drafter Brian Shutter. WAI Vice President Scott Koester, LJA President Troy Tooz, LJA Mechanical Engineer Brander Halver and WAI Administrative Director Michael Paulson. LJA Executive Administrative Assistant Collette Jerstad and Administrative Assistant Sande Kochis. The heat is on and so is another BBQ at the LJA. Perfect weather provided the opportunity to take the celebration outside and soak up the rays. The sun was bright and so was everyone's faces as we enjoyed the food and warm summer day. LJA announces completion of new office building in West Fargo, ND! LJA is excited to announce the completion of the new office building for IUOE (International Union of Operating Engineers) Local 49 in West Fargo, ND. The new facility includes a conference room and features a large meeting room that will provide training to the Union’s members and offices for the business agents. The project site also includes outdoor areas that will provide “hands-on” equipment training beyond the classroom. The building construction is precast concrete wall panels (Wells Concrete) and steel framing, materials selected to stand the test of time while providing low maintenance costs. Congratulations to everyone involved on this project! LJA and SRK Development are excited to announce the Grand Opening of the Candlewood Suites in the Omaha-Millard area. This hotel is the latest project completed with SRK that will complete the build-out for this pad development and bring a great asset to the community for many years to come. 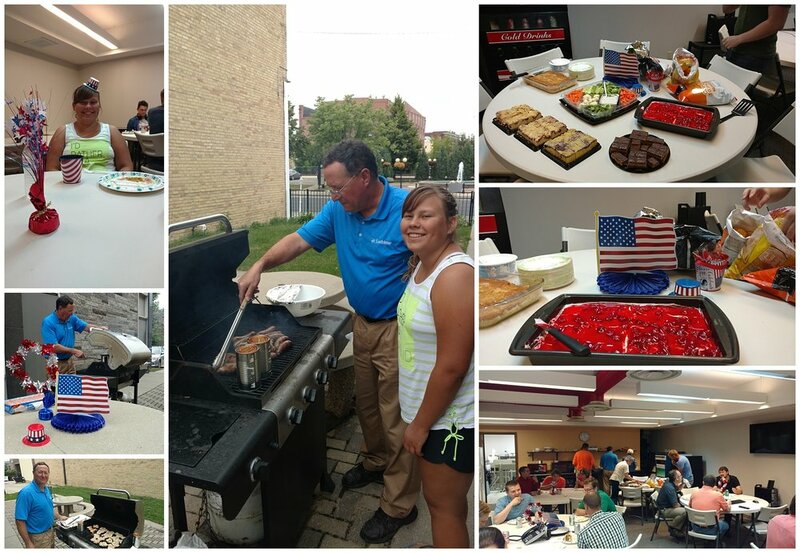 We celebrated Independence Day at the office with our annual 4th of July BBQ. Awesome food (thanks for grilling Cam! ), great conversations and a lot of happy faces made it a special day. Wishing you and your family a happy 4th! Grilling season is finally here! We couldn't wait any longer so we fired up the grill at the office yesterday to celebrate. What else can you say other than it was the perfect way to start the summer at LJA. Next up the 4th of July BBQ! LJA celebrates the groundbreaking of the Fairfield Inn and Suites in Northfield, Minnesota! LJA is excited to announce that the Fairfield Inn and Suites hotel has broken ground in Northfield, Minnesota. The Fairfield Inn is expected to require one year of construction, and hopes are to open the hotel in April 2018. The hotel will consist of 80 rooms and will also include a pool and fitness room. A bar with limited food will also be accessible to guests and to the public, with a deck and patio area facing the river. Underground heated parking will also be provided, as part of the solution with the city to avoid any potential flooding issues. Congratulations to everyone involved in this project! LJA and SRK Development are excited to announce the ground breaking of a brand new, 92 unit Holiday Inn Express Hotel and Event Center in Dakota Dunes, SD. The Hotel will feature a swimming pool & hot tub, large fitness center, and the Event Center, which can host up to 500 people with approx. 7,000 SF of floor space. This is the third hotel that SRK and LJA have worked together on, and construction is scheduled to be completed by next summer. LJA is the architect and engineer of record for all major design services. In honor of Architecture Week, LJA decided to do something unique involving LEGOS. Keeping it nice and simple, we brought our minds together to construct a miniature model of the Fargo LJA office. We kept the project a secret, having fun teasing you all week on our social media pages, but the time has finally come to reveal the masterpiece. We kept the project a secret, having fun teasing you all week on our social media pages, but the time has finally come to reveal the masterpiece. Introducing the LJA office made out of LEGOS! Happy St. Patrick’s Day from LJA! Five teams took to the challenge of making the ultimate bowl of soup during our annual St. Patrick’s Day Potluck. Once again, it was a tough competition, with a record setting turnout in the Team Building Room. Judges sampled knoephla, ham & cabbage, Guinness corn beef & cabbage, chicken wild rice and cheesy chicken tortilla soup. While their taste buds were blown away in amazement only one soup could claim the number one spot. Todd Jelinski and his chicken wild rice soup took home the crown finishing with a comfortable win. Congratulations to Todd and everyone that came out to make this a wonderful event! Kolton has worked at LJA as a Structural Engineer-in-Training for over a year. He received LJA’s Core Value Reward in 2016 for Return on Effort in obtaining personal, business and financial satisfaction through efficient work practices. He was nominated for this award by his fellow employees. He graduated from the University of North Dakota in 2015. What interested you about being an engineer? When I was young, I always enjoyed creating/building with LEGO’s and as I grew those LEGO’s turned into wood. I have made items such as a filing cabinet, a kitchen table, and stools. Engineering was the choice rather than Architecture because I have always been intrigued by the science behind engineering. Being able to see the capabilities of the construction products we use. Taking those materials and forging them into something creative and real. What have you enjoyed most since you've begun working at LJA? Being able to apply what I have learned in my coursework to a higher degree and having exposure to different types of engineering material that I was unable to study through school. Kristi has recently joined the LJA team as an Electrical Engineer. Her combination of job experience with the soft-skills developed in her various volunteer work has helped her develop into a goal-oriented individual with strong leadership capabilities. She is organized, highly motivated and a detail-directed problem solver. She has a proven ability to work in unison with people in both technical fields and skilled trades. In high school, I had a keen interest in math. My Algebra/Geometry teacher was somebody for whom I had a great deal of respect. When I told him I was considering going to college to be a math teacher, he encouraged me to look into engineering. At that point in my life I really had no idea what an engineer did, but I took his advice. I found that I loved the logical approach to problem solving in the courses I took. I'm thankful for the small school I attended that allowed my math teacher to know enough about me to give me advice that helped shape my future. If I had to boil it down to one thing, my favorite part of being an engineer is that it allows me to get paid to feed my curiosity of finding how things work and be a part of the process of designing things that work better than before. When my children were younger, I liked being able to see them begin to take an interest in how things work. The engineer in me has always been right there with them, tearing into things to see what's inside something that was broken to see if we could fix it or make it work better. What has been your favorite or most rewarding project of your career? I've got a plethora of great memories as I reflect back on my career. The best memories of rewarding projects have always involved a team effort from a variety of people who all have the same goal in mind. One that comes to mind was in my volunteer world. I got involved with volunteering in IEEE (Institute of Electrical and Electronic Engineers) nearly 20 years ago and some of the best friends I have were made through volunteering. The PBS station in Boston, WGBH, was creating a pilot for a show called "Design Squad", and IEEE was a major supporter. I was asked to represent IEEE in helping define the basis for the show. We stumbled some at first but eventually found our footing. The end result was a successful show that is still in production, helping high school students through design challenges each week. The best take-away from that whole process was seeing how the students were encouraged to try their designs and work through determining what worked well and why something didn't work. Giving up was never something that was discussed. Teamwork was crucial to the success of every design project, and in order for their team to succeed, these teens had no choice but to discover their strengths and help their team win the challenge. Witnessing them learn these lessons served to strengthen my approach to teamwork in my personal and professional worlds. We developed a program for volunteers to take to their local middle-school and high-school to hold either a multi-week, after-school activity or a full-day activity of team-based design challenges. To encourage this, I attended several large IEEE meetings, my time focused on having the attendees participate in one of the design challenges. While reluctant at first, I was approached the remainder of the weekend by many who were excited to plan an event at their local school or, at the very least, have a fun new activity for the next time their grand-kids were visiting them. It was a project that allowed the stereotypical "boring" or "geeky" engineer to see that we can still have fun and laugh while designing and learning.